This is The Land Yacht. 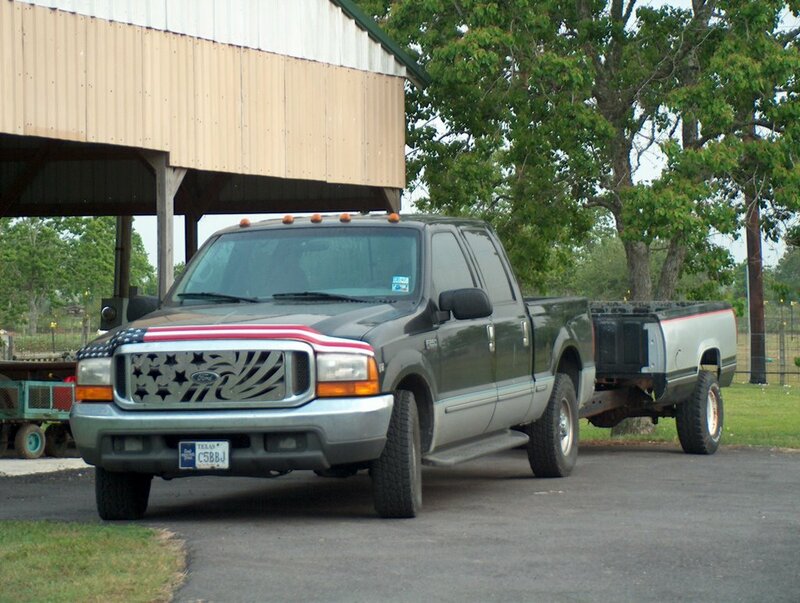 She's a 1998 F-250 Super Duty 7.3 diesel pick up. She's my primary driver during the summer(diesel costs 30 to 40 cents more in the winter and it gets less mileage because of the way it's cut for home heating fuel up north). She has 222, 480 miles on her and has been damn dependable. If and when we get a bigger horse trailer we will name that The Land Ark. The trailer behind my truck is a 9 foot bed from a chevy p/u that I use for hauling dirt and mulch. It has hydraulics to lift the bed to dump the material. It's very useful. It's funny the locals have their hydraulics to make their cars bounce up and down and I have mine to make the trailer go up and down. I think mine is mo betta,lol. Anyway the workouts have been on track, still moving up in tiny increments on most of the weight(2.5, maybe 5 lbs if I have had my wheaties), but my eating of late needs a little improvement. I'm into frozen yogurt his past week and can't shake the habit. It's not as good as yogurt and cottage cheese at night, but boy it tastes soooo much better. I'll have to work on that! Let's see, Susan named the baby cow Dino, so no Z names this time. I think that's it for now. Man I can't wait to go back to work, I need a little rest, lol. mmm, frozen yogurt. i haven't had that in a while. if i had it around i would eat it. i did have some unauthorized easter chocolate today. i hope my truck lasts as long as yours has. i just paid it off and it only has 60,00 miles currently. let me know next time you go to cm. i work at the catering desk, which everyone thinks is the info desk. i'm only there on weekends though. and, sometimes not at all. like this weekend, out of town for a wedding. if you go to cm soon, get some muscat grapes. a little pricey, but damn they're good. That looks like a huge spread you have there Troy. I'm especially impressed by all the paved driveway. sweet ! That is one fancy grill ya got on that there pick-em-up truck, cowboy. Where in tarnation are you driving to all the time, boy? 222,480 miles in 8 years? That's about 28,000 miles a year. That's about three times what we average. That truck is SWEET! It's funny, until I moved to Kansas, I had never seen anyone use a truck bed as a trailer, but they were everywhere in Wichita. And now I see they're in Texas too! I don't think they were so fancy with hydraulics, though. Too cool!